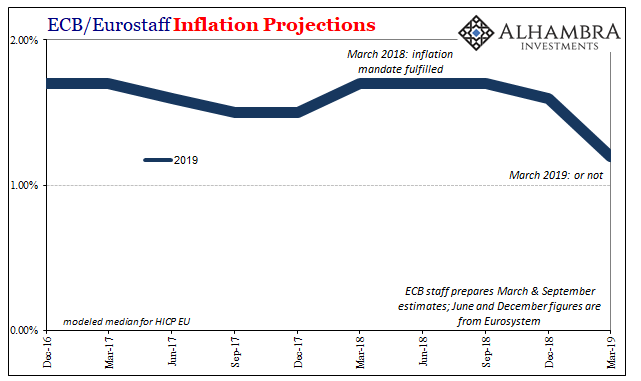 I don’t think that was actually the case; the reason for today’s pessimism, I don’t think, wasn’t how the T-LTRO was “less generous than previous packages.” Rather, perhaps it was the very fact Draghi is proposing anything after a very long time claiming, enthusiastically, how Europe’s economy was absolutely booming. The danger, from the central bank perspective, is when you shift unexpectedly in the “dovish” direction some might get to wondering why. This peril is heightened when expectations have gotten so far out of whack. From early 2018 to early 2019, from “this is inarguably awesome” to “now we are worried.” That might not sit well when it finally comes out. 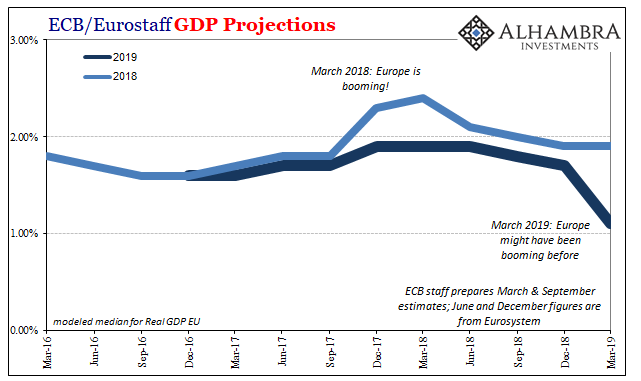 If even the most optimistic among us, and central bankers have a lot riding on the idea of recovery, are suddenly not optimistic at all, maybe it doesn’t matter how much in any T-LTRO is offered. What does is the mere fact the ECB feels it necessary to pledge anything whatever the amount.